CLAT 2019: CLAT is a National Level LAW Entrance Examination which is conducted for the admission to various UG and PG law courses. 19 Indian National Law Universities (NLUs) managed the CLAT Examination on the rotation basis. Latest Update: Released!! Application Form will be Abailable on 13th January. Applicants get admission in various government and private law colleges in whole over the country through the CLAT Score Card. An applicant who appears for the CLAT 2019 Exam is required to know the information regarding the eligibility criteria, application form and registration dates. So we are providing all the information regarding the CLAT 2019. The CLAT starts giving the notification from the month of December. The application will be available form the January 1st week and the last date for submitting the application form is March 2019. The expected CLAT 2019 Important Dates is given below the table. Those candidates who are preparing for the CLAT 2019 is required to fill the application form. The application form is available in the online mode on the official website of CLAT 2019. We are providing the here the detail regarding the CLAT Application Form 2019. The CLAT Application Form 2019 will be available in the online mode on the official website. The registration process will start from the January First Week to March Last Week 2019. Applicants require uploading their photo and signature with given dimension and formats. There is a certificate required for the Specially Abled Person(SAP). After successful entering the entire detail applicant required to submit the form with the required payment of fees. A candidate who filling the application form is required to submit the fees. The applicant can submit the fee through credit card, debit card, pay wallet, net banking etc. The CLAT Application Fees is divided according to the category wise. Once the fees are paid it is not refundable. The fee is given in the table. 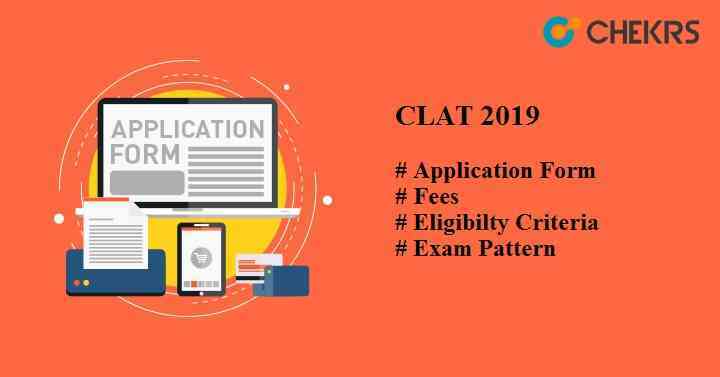 Those applicants who will give the CLAT Exam 2019 is required to fulfill the condition of the eligibility criteria. The complete detail regarding the CLAT Eligibility Criteria is given below. Nationality: Candidates who are Indian National and NRI can apply for the CLAT Exam. Foreign candidates will get the direct admission in the concerned institutes. NLU admits such candidate who is NRI Sponsored. Age Criteria: There is no age criteria for the candidates who apply for the UG and PG Courses. An applicant who preparing for the CLAT 2019 Exam is required to know the exam pattern. Through the exam pattern, they will get the idea of the question paper comes in the exam. The CLAT Exam Pattern 2019 for the various courses is given in the table. An applicant who will give the entrance exam of the CLAT is required to download the syllabus. Through the syllabus, they will come to know the important topics comes in the exam. The CLAT Syllabus for the various UG and PG courses is given below. Those applicants who will give the CLAT 2019 exam is required to start the preparation. As the competition is going to be tough as the no. of applicant appear will be more as compared to the no. of seats available. So we are providing here the CLAT Preparation Tips. The applicant can follow the tips to secure good marks in the exam. Solve at least last previous year 10 question papers to get the idea about the exam and the pattern of the exam. Applicants have to manage the time and solve the question within the time limit so that they can give the time to the other questions. Read only the useful books which help the candidate in the exam. Applicants can prepare the notes by themselves so that they can read at the last time of the exam. Applicants can also prepare for the exam from the online mock test for testing their speed limit. An applicant who will give the exam of CLAT 2019 is required to download their admit card. The CLAT Hall Ticket contains the details regarding the examination schedule, examination center along with time. Applicants make sure that none of the candidates allow for sitting in the exam without their admit card. Cut off marks are minimum marks in which the applicant require to obtain. An applicant who got the marks more than the CLAT cut off Marks is eligible for the admission in various colleges. An applicant who gets their name in the CLAT Merit List is eligible for the filling the form of counseling. The merit list of the CLAT is declare online. The applicant can see the merit list on the official website of the CLAT.